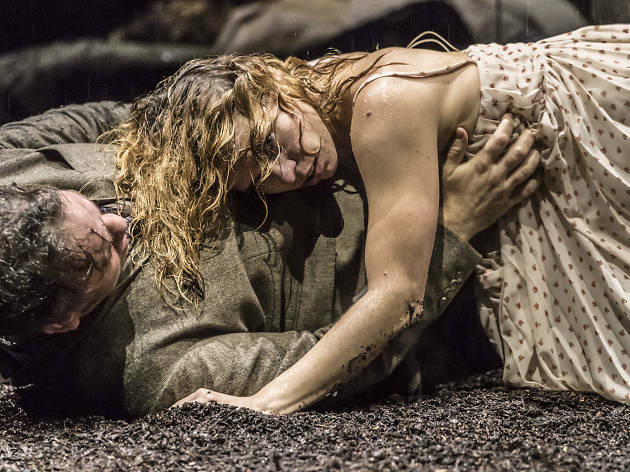 Simon Stone’s high-gloss infertility thriller, Yerma, takes its name (which means barren) from Federico García Lorca’s classic play, but somewhere around the first pubic-waxing joke it becomes clear that we’re far from Lorca’s rough-textured 1934 tragedy. Stone and Lorca share an outline: A woman (Billie Piper) can’t conceive, her man (Brendan Cowell) isn’t helping, and the task of getting pregnant breaks her heart and then her mind. But the rest of Stone’s version is hypermodern, with characters blogging one minute and getting blitzed at a muddy, Glastonbury-esque music festival the next. Its sexual politics lag a bit; here’s a she-can’t-have-it-all prurience that harks back to the ‘80s, and a freaked-out approach to multiple fertility treatments that gets uncomfortably close to Reefer Madness. But if you can stomach a portrait of a woman letting the procreative drive steer her completely round the twist, you won’t do better than Billie Piper’s powerhouse performance, a thing of such hectic emotional commitment that you fear for her actual sanity. In a script full of named characters, Stone simply calls Piper’s character Her, which hints at how confused she is or perhaps how universal: Variously, Her wants to fill her huge house with children, to fix her own loveless upbringing by her stone-cold mum (Maureen Beattie) and to compete with her sister (Charlotte Randle). When an actual baby enters in a scene, his cuteness is like a special effect, and indeed much of Yerma is physically striking: Piper is a startling beauty, as are Her’s best friend and assistant (Thalissa Teixeira) and ex-boyfriend (John MacMillan). The playing space is something like a fish tank: On two sides of Lizzie Clachan’s chilly, brilliant design, we stare down at action happening in a central corridor walled by glass, a vitrine that separates the audience from the increasingly desperate characters. Sets—even whole rain-drenched heaths—appear and vanish as though by magic. To some extent, this gorgeousness aestheticizes the terror; we hear everyone’s voices through microphones, which flattens our emotions while heightening theirs, and it’s sometimes hard to get a purchase on the play behind the magazine-spread perfection. That’s what makes it so astonishing when Piper bashes her way into intimacy with everyone in the theater. She screams and curses, shudders and weeps, all with a fearless, ragged truth. After resenting the glass for the first half, I began to feel as though it was there for our protection. There’s no telling what emotions like those could do if a beast this angry were let out of its cage. Park Avenue Armory (Off Broadway). Written and directed by Simon Stone. With Billie Piper. Running time: 1hr 45mins. No intermission. Through Apr 21.